The government is offering NHS staff a 6.5% pay rise, after almost a decade of pay freezes and 1% pay rises. With an NHS in almost permanent crisis and near collapse, this appears like a good thing, but when compared with the reality of the present state of the NHS, it’s a poisoned chalice that union members should reject. Is the pay rise really 6.5%? The pay rise is nowhere near as good as the media is making it out to be. It’s a three year pay deal, with the 6.5% being spread over three years; 3% first year, 1.7% second year and 1.67% the third year. This is still a below inflation pay rise. The Office for Budget Responsibility projects inflation to be 8.8-9.6% over the next three years. So NHS staff are still receiving a real term pay cut over the period, just slightly less than the previous 8 years. There is also 1.1% unconsolidated rise in the second year, unconsolidated meaning it is not permanently counted in the pay structure, but just given as a one-off lump sum at the start of that year. The government has offered a few changes to the pay band structure which will lead to immediate rises for the minority of staff currently at the bottom of their pay band, but no benefit to more experienced NHS workers who are further up the pay bands. The government offer also changes the way staff move up a pay band, meaning progression will be in fits and starts, rather than annual. And there’s another big catch - in future, advancement will be performance related, based on yearly appraisals. Performance related pay has been shown to be bad for black and ethnic minority staff, and disabled staff, as it creates another area in which they can suffer discrimination. It could be used to penalise outspoken union activists. It may also trap staff in their jobs as they won’t be able to move post during the 2-5-year gap between pay steps for fear of losing out. At least the ‘living wage’ is being brought in to the NHS. This is partly out of necessity; NHS pay had been frozen for so long that the yearly increase in the national minimum wage has almost overtaken band 1 and 2 pay bands. 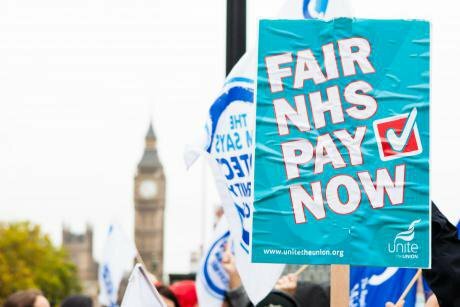 To avoid the embarrassment of being forced to raise NHS pay by the legal minimum wage, the government has decided to give their pay a much-needed boost. What do the government want in return? The government clearly feels that – as they are not faced with active strike action to force them into a proper offer – they can demand our workplace benefits and pay in return. The original pay deal wanted to claw back one day’s annual leave from all staff, according to leaks. The outcry from NHS staff, the public and the Labour Party saw this withdrawn. However the government are still asking for givebacks in return for our meagre rise. They want bands 1-3 to progressively give up their unsocial hours rates over the three years of the deal. So lower paid staff will get an initial pay boost, but in the long run they will lose out on reduced unsocial hours payments. The plans also include changes to sick pay, so anyone earning over £18,160 (in other words, all but the very lowest paid NHS employees) does not receive their usual unsocial hour rate when off sick, only their base rate of pay. Why a pay rise now? It’s important to look at the context in which this pay rise is being offered. NHS staff have endured 8 years of pay freeze or 1% pay rises. We only secured the commitment to a 1% rise after going on strike in 2014. This pay freeze has caused a 10-14% loss in the real value of our pay over this period, and combined with increasing pressures due to austerity, has caused a recruitment crisis which is pushing the NHS to the point of collapse. The health service has over 100,000 vacant posts, of which 40,000 are nurses, 10,000 are doctors and 10,000 are HCAs. The pay freeze and staffing crisis are driving thousands of nurses to flee the unsafe and unhealthy working conditions in the NHS, with more nurses leaving the NMC register than joining for the last two years. Combined with the fact that 100,000 nurses - almost a third of the NHS nursing workforce - are within 10 years of retirement, and the impact of Brexit and visa restrictions driving nurses away, this creates an existential crisis for nursing and the NHS. In response to this crisis in nursing, the RCN was pushed by its members to campaign on pay. They launched the “Scrap the Cap” campaign and began to hold protests and marches around the country. The campaign culminated in the RCN’s first ever indicative ballot for strike action in April 2017. While turnout was poor, the vote in favour of action was 78%, clearly demonstrating nurses anger and willingness to fight. Theresa May responded by declaring the pay cap over in September 2017. At this point, all the NHS unions decided to bypass the Pay Review Body, and instead use the traditional union method of submitting a pay claim to the government. This unity strengthened their hand and allowed them to set out terms for the pay deal they wanted, rather than relying on the deliberations of the Pay Review Body. All 14 unions submitted a joint pay claim for inflation (at the Retail Price Index, RPI) plus £800, which started a series of negotiations over pay, which have now concluded with the deal which is on offer. The deal is meagre compared both to what we have lost. The boosts for the lowest paid and people at the bottom of their bands are welcome, but the pay rise does not address the serious staffing crisis facing the NHS, and particularly nursing. While the RCN trumpets 29% pay rises for some staff, most NHS staff (52%) are at the top of their pay band. For them, there is only 6.5%. Overwhelmingly these staff are also those who are within 10 years of retirement. This deal offers them little reason to stay in post and help stave off the looming staffing crisis. The figure of a 29% pay rise for some is misleading as it counts incremental rises in with the pay offer and the boost for those at the bottom of their pay band. Unions have always rejected the argument that increments are a pay rise; they are meant to reflect skills and experience developed through time in service. Yet the union pay calculator is deliberately misleading staff, representing incremental rises as part of the pay deal to increase its appeal. While this deal was presented as the best we can achieve without strike action, all that it took to achieve this deal was one indicative ballot for strike action by the RCN, and a joint pay claim by all the unions. No other union has balloted for action yet. Imagine how much more we could win from the government if we threatened them with joint strike action between all NHS unions. As a member of Unite’s National Industrial Sector Committee for Health, I was privy to details of the pay deal as it was being negotiated. We were told that the government “red lines” were asking for one or two days of annual leave, and bands 1-3 moving to the unsocial hour rates for bands 4-8, in return for any pay rise. Yet the government backed down from these “red lines”, after little more than a social media outcry. This is a government without an overall majority, unpopular for their treatment of the NHS, and the damage that eight years of austerity have done to society, and facing quite possible collapse due to the failing Brexit negotiations. In this precarious position the government cannot afford for an industrial dispute to develop in the NHS. A big fight with NHS staff might even bring them down. They desperately want to lock us in to a three year pay deal right before Brexit, so when Brexit occurs and causes inflation to skyrocket even further, we will be stuck receiving 1.7% pay rises for two years. For all these reasons, I urge all union members to reject the deal. We deserve and need more after eight years without a pay rise. The NHS desperately needs well paid and highly motivated staff to rescue it from its current crisis. And we can’t waste this chance to win the pay and funding the NHS and its staff need to survive in to the future. All the major NHS unions except for the GMB are recommending this deal to members. This is the wrong stance to take. All the unions ought to have the best interests of the NHS at heart, yet they are recommending a deal which doesn't meet the needs of staff or the service. This is much bigger issue than securing a little extra money in our members pockets. It’s about securing a future for the NHS. Agreeing to this deal will not alleviate our struggles to pay our bills, it won’t solve the NHS staffing crisis, and could even accelerate it as overworked, underpaid staff leave rather than stay working for a government and health service which doesn’t value them. The government is threatening that if we don’t agree, they will take the money for funding the pay rise off the table and force us to accept a 1% deal through the Pay Review Body. This is a disgraceful threat and an attempt to blackmail NHS staff. We should call their bluff and campaign to reject the deal. We can reject the deal, then push for coordinated strike ballots across all NHS unions. Joint coordinated strike action is the biggest threat to the government. Coordinated ballots would maximise turn out and help all unions get past the 50% minimum turnout required for legal strike action. Strike action is doable. The university lecturers union won a ballot for strike action over pensions just a couple of months before, and so did postal workers. We can too, we just need to organise ourselves and fight for it with the same dedication we use to keep the NHS working every day of the week. The first step in this is campaigning to reject the deal. Follow the “Ditch the Deal” Facebook page for updates and information on the campaign to reject the deal. Full technical details of the pay agreement can be accessed here.